From the producers of The Texas Chainsaw Massacre, comes The Hitcher, an action-packed, bloody thrillride. This movie delivers intense edge-of-your-seat chilling suspense and relentless terror as the race to reveal the terrifying truth about The Hitcher ensues, making this the definitive DVD for all action/horror fans. $7.818 million on 2835 screens. If you create a remake, it usually works best if you pick something that didn’t quite succeed the first time. 1986’s The Hitcher turned into a cult classic, so the folks behind the 2007 version ran more risks than normal. However, since remakes of other iconic horror flicks have done well at the box office, I guess the folks behind Hitcher thought they should take a chance. Young couple Jim (Zachary Knighton) and Grace (Sophia Bush) set out on a spring break road trip across the US southwest. Along the way, they almost run into John Ryder (Sean Bean), a driver whose car dies. The fact the dude just stands in the middle of the road and doesn’t flinch when almost slammed gives them the creeps, so they depart without any assistance offered to him. Eventually they all cross paths when they stop for gas and Ryder gets dropped off at the same station. Ryder needs a lift to a nearby motel, so Jim agrees to do so out of guilt. He soon regrets this decision, as Ryder quickly reveals himself to be a nutbag. Jim manages to boot Ryder from the car, but that doesn’t end his threat. The rest of the flick follows the persistent terror Ryder exacts on the couple. Hitcher sets its tone early. In the opening scene, a rabbit tries to cross a highway – and promptly becomes roadkill. A few minutes later, a dragonfly zips across the screen – and splatters on a windshield. That’s the kind of crass, unpleasant movie Hitcher is, as it throws nastiness at us with no purpose other than to provoke a basic “that’s gross” reaction. Whereas the original Hitcher turned into a psychological thriller, the remake stands as nothing more than a cheap set of limp scare tactics. It offers no subtlety to its portrayals at all, which means it becomes hard for the audience to identify with the material. In the original, we felt involved since we could relate to the circumstances, but here Ryder is nothing more than a basic bogeyman with no depth or impact. Via Jim and Grace, we find an almost unimaginably faceless couple. One might want to argue that the film intentionally portrays them that way so the audience members can better fit themselves in the characters’ places. However, I don’t believe this to be the case. Instead, I just think the filmmakers cast a couple of attractive but bland actors and didn’t bother to do anything to make the parts more interesting. This generic sensibility really mars the whole production. In addition to the bland characters and predictable thrills, we find visual styles torn out of the music video playbook along with trite scary movie music. There’s absolutely nothing on display here that acts to make the movie even remotely memorable or original. Because of this, The Hitcher has more in common with the dull 2006 version of When a Stranger Calls than the pretty effective reworkings of Texas Chainsaw Massacre and Dawn of the Dead. At no point does it threaten to top its inspiration, and it also fails to succeed as any form of cinematic entertainment. By the numbers and wholly forgettable, The Hitcher is a flop. 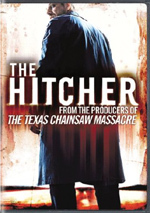 The Hitcher appears in an aspect ratio of approximately 2.40:1 on this single-sided, double-layered DVD; the image has been enhanced for 16X9 televisions. No significant issues cropped up through this nice transfer. Only a smidgen of softness ever appeared. I noticed some minor edge haloes that created a little looseness in a few shots, but those weren’t substantial. Most of the movie seemed accurate and well-defined. I witnessed no signs of jagged edges or shimmering, and source flaws remained absent. Like every other modern horror flick, Hitcher went with a pretty intensely stylized palette. The colors tended to vary from arid/sandy to sickly blue/green to pus yellow. The DVD replicated the tones accurately and made them fit the material. Blacks were a little dark but usually appropriate, and low-light shots appeared smooth and clear. Overall, the image remained positive. Similar thoughts greeted the solid Dolby Digital 5.1 soundtrack of The Hitcher. Most of the soundfield’s activity related to scenes on the road since that’s where most of the film took place. Cars zoomed around the room well, and other elements like helicopters and gunshots also filled out the spectrum in a realistic, satisfying manner. Music showed very nice stereo imaging and also boasted good reinforcement from the rear. The soundscape was never showy but it created a solid feel for the action. Audio quality also was very positive. Music fared best, as the score and songs seemed dynamic and tight. Effects came across as clear and accurate, with good low-end response and punch. Speech was natural and distinctive. No problems popped up in this very good soundtrack. When we head to the extras, we open with eight Deleted Scenes. Taken together, these run a total of 22 minutes, 56 seconds. We find “Introducing John Ryder” (1:28), “Ryder on a Rampage” (4:02), “A Waking Nightmare” (5:03), “Asleep with the Enemy” (4:05), “Cold & Scared” (1:30), “Dangerous Curves” (2:24), “Rest in Pieces” (0:34) and “End of the Road” (3:47). With almost 23 minutes of material, you’d expect something interesting to show up here. Despite its title, “Introducing” just shows a little more of Ryder in the police station; how does this “introduce” him? Virtually all of the scenes come from the movie’s mid-point or later, and they usually just expand on sequences already in the flick. We also get a few alternate versions of events, such as in the motel; we find seemingly endless variations on it. Not even a moderately different ending proves interesting, as all of these clips bore. Four featurettes follow. Dead End goes for 13 minutes, nine seconds as it looks at the sequence in which Jim dies. We hear from actors Zachary Knighton and Sophia Bush, KNB EFX Group’s Mike McCarty, Harrison Lorenzana and Jake Garber, director Dave Meyers, and producer Andrew Form. We watch the preparation of the Jim dummy that actually gets ripped in half and watch the filming of the sequence. Some of the parts with Knighton are dopey as we follow his through the day, but we get a nice glimpse of how KNB developed the dummy and the shooting of the scene. In the 10-minute and two-second Road Kill: The Ultimate Car Crash, we hear from Form, Meyers, Bush, Knighton, stunt coordinator Kurt Bryant, producer Brad Fuller, stunt doubles/drivers Russell Solberg and Corey Eubanks, and actors Sean Bean and Neal McDonough. “Crash” examines some of the movie’s big vehicular stunts. These offer some good shots from the set and we learn decent notes about the stunts. However, “Crash” tends to be pretty superficial and fluffy, so don’t expect great detail. It’s a decent featurette, though, as it lets us know some of the challenges involved in these stunts. Fuel Your Fear: The Making of The Hitcher lasts 10 minutes, 56 seconds and includes Bush, Knighton, Bean, Meyers, Form, Fuller and director of photography James Hawkinson. “Fear” offers some basic notes about cast, characters, story, how Meyers got the gig and his impact on the production, locations and visual choices. “Fear” brings us a pretty simple promotional piece without much to make it worthwhile. Finally, Chronicles of a Killer runs four minutes, 36 seconds and presents the events of the movie as if they were a breaking news story. It’s a fun way to check out these elements and actually becomes more entertaining than the film itself. A few ads open the DVD. We get promos for Hot Fuzz, Smokin’ Aces, HD-DVD and Alpha Dog. No trailer for Hitcher appears here. No entertainment appears here either. While the original version of The Hitcher worked pretty well, the 2007 remake offers nothing more than a boring piece of violent fluff. 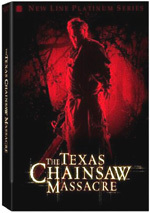 The DVD presents very good picture and audio along with some average extras. Leave this Hitcher on the side of the road.